iPhone 5 case roundup for November 2012 - iPhone.MY - Daily News On Mac, iPhone, iPads, iPods and more! iPhone 5 cases are starting to arrive at the iPhoneMY labs in droves, so we’ll be doing a series of roundups over the next month or so highlighting some of the best of the crop. In today’s roundup we feature the Pad & Quill Little Pocket Book, the Grove Bamboo case, the Tavik Time case, the Seidio Surface case and the totally unique U Bling Do It Yourself case. iPhoneMY has reviewed a number of cases from Minneapolis-based Pad & Quill, and they’re all beautiful leather-bound wood-lined cases. The Little Pocket Book for iPhone 5 (US$59.99, see image at top of post) takes one of these classic cases and adds a wallet to the front cover so that you can carry your most important items — ID, credit card, cash, and iPhone — in one case. The wood frame for the iPhone 5 is made of lacquer-finished Baltic birch that has been machine routered to fit the phone perfectly. On the wallet side, there are leather pockets for your ID and credit cards, as well as a larger pocket for folding cash. The case comes in either black or brown leather on the exterior — the black case interior pockets can be either “french roast” brown or mahogany red, while those for the brown case come in a choice of either deep sea blue or forest green. If you’re looking for a thin, minimalist iPhone 5 case, then the Little Pocket Book is probably not for you. While your iPhone 5 is a svelte .30″ thick, popping it into the Little Pocket Book is going to increase the width to about .68″. Still, you can replace a wallet with this case and it both looks and feels great. Portland, OR-based Grove makes some beautiful iPhone cases as well, also using natural materials. 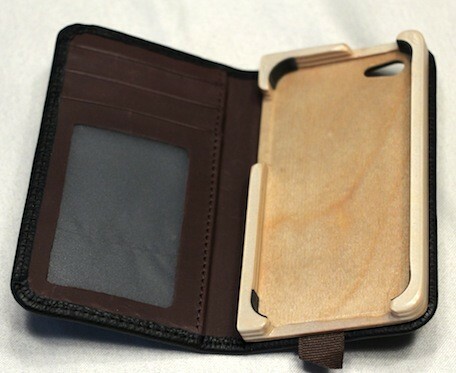 With this case, the “wood” is actually a grass — bamboo — and the iPhone 5 case ($79) provides protection and beauty in a lovely, thin, and lightweight package. A plant fiber composite material in either black or white is used around the bezel of the phone to add both contrast to the case and protection for the iPhone. The case is made up of a small bottom piece with holes for the Lightning connector and earbud jack, and a larger top piece containing openings for the volume/lock buttons and the camera/flash combo. The on/off button is actually another piece of wood that flexes to push the “real” button on the phone when depressed. Inside, the back of the phone is protected by a soft black felt material that covers some pads that help “push” the phone into the front of the case for a snug fit. 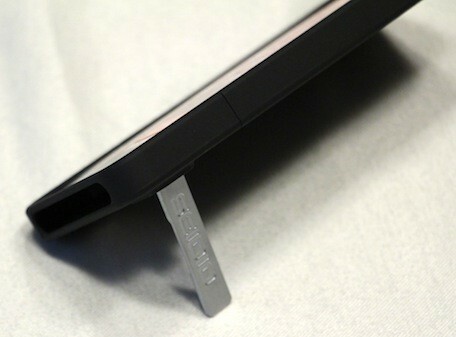 The case weighs just 1.1 ounces, and with the case installed your iPhone 5 will only be about .44″ thick. The cases can be monogrammed for personalization ($15 per monogram), you can choose a laser-etched artwork from a large variety ($20 extra), or you can even provide your own logo or artwork for a truly unique case ($129). The Grove Bamboo Case really has to be seen and touched to be believed — it’s quite a gorgeous piece of art. Of the iPhone 5 cases being reviewed today, this is probably the most commonplace. The Tavik Time Case ($29.95) is made of a thin resin material (black, white, grey, pink, cyan, or green) with a cutout design that accentuates the phone. The Time Case adds virtually no weight to your iPhone 5 — just .5 ounce — and is also the slimmest case in this review at just .375″ thickness. If you aren’t particularly blown away by the Time Case, I recommend visiting the Tavik website and taking a look at their catalog. The Staple and Channel cases are both lightweight and slim, and there are other designs shown in the catalog that might be concepts at this point, but represent a bold direction for this Southern California-based design house. The Surface Case ($29.95, $49.95 in a combo version with holster, $54.95 with holster and kickstand) is another plastic case that adds little in terms in weight or bulk to your iPhone 5. 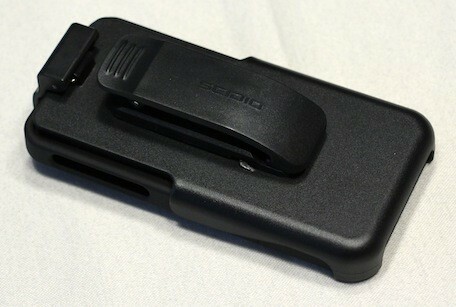 The review case was the Combo with a kickstand and holster. While the case can be carried by itself in pocket or purse without too much of a fuss, those who like to carry a phone on their belt will love the adjustable holster (lined with felt to protect the iPhone screen). The coolest feature on this case is the kickstand, which flips out of the back and lets your iPhone 5 sit up in landscape mode. It’s perfect for watching movies with the iPhone sitting on a table. The case is available in black, glossed white, sage green, garnet red, piano black (gloss black), amethyst (purple), royal blue, and fuchsia. This is probably the most fun case I’ve ever had the pleasure of reviewing! 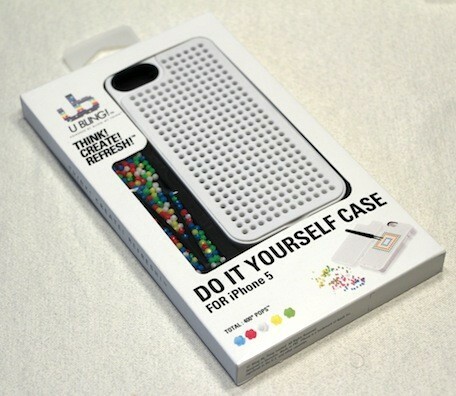 The U Bling Do It Yourself Case (€29.99) consists of a case with a special “sheet” perforated with a bunch of small holes. With each case you get about 400 “pops”, small plastic pieces that are popped into those holes using a special installation tool. The result? You can create your own fun and completely unique case with a pattern that you design. There’s a design tool online for perfecting your design before you start inserting the pops, as well as a free iPad app. Customizing this case can be enhanced by adding a different colored back (they come in pink, white and black) and then using a Fun Pack that comes with 600 more pops to play with.